In the death of John C. Pellett, 73, which occurred at about 1 o'clock Wednesday afternoon a familiar -- is removed from Prospect Hill. Two days before his death he rode down street in apparent good health, but he was taken with an affliction of the heart about noon Monday, and failed gradually until the end. 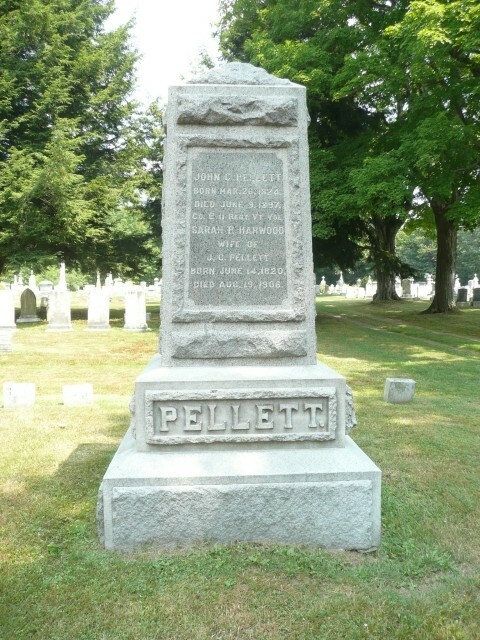 Mr. Pellett was a son of Almira Cady and Rufus Pellett, and was born in Canterbury, Conn., March 24, 1824. At the age of 18 he went to sea, and spent seven years upon the water. During a part of that time he held the post of Second Mate. He left the sea with intent of studying navigation and then returning, but he was dissuaded from doing so, and went to live with his uncle in North Brookfield. There he met Miss Sarah Pellett Harwood, and they were married Jan. 29, 1849. After spending two more years in North Brookfield, Mr. Pellett moved to Chicopee, Mass., where he spent two years in railroad work between Chicopee and Springfield. In 1853 he came to Brattleboro to work on what is now the Boston and Maine Railroad. He enlisted in Company E., 11th Vermont volunteers in 1862. He served for a while in the heavy artillery, but was transferred to the infantry corps, and during the battle of Chancellorsville, which took place the next year, and in which he was color bearer, he was struck in the left arm by a shell which shattered the bones and made amputation at the shoulder necessary. The operation would have caused the death of a less vigorous person, but he was able to return home in a few weeks. He knocked at the door, and, receiving the usual inquiry "Who's there", astonished his wife by answering, It's I, John". A little later he re-entered the employ of the railroad as a section foreman, and held that position until seven or eight years ago. He was always a hard working man, performing in a day with one arm, work which would be difficult to many men with two arms to accomplish. By shrewd dealings, and the practice of economy he managed to accumulate considerable property. Besides a widow he leaves three sons;Thomas A. and John C. of Worcester, and Will of Chicago, who were contractors and builders, a daughter, Mary, who is the wife of Andrew Thomas, of Claremont, N. H., and an adopted daughter, Sadie, who lives at home. The funeral will be held at the house, 55 South Main Street, at 2 o'clock tomorrow, Rev. C. O. Day officiating. The burial will be in Prospect Hill cemetery.